It runs out to $79 assembled + $14 shipping (for the USA) or $93. You can get it DIY assembly for $69 + $12 shipping (for the USA) or $81. I put it on the same Coleman Camp Stove ( two burner unleaded gasoline / naphtha) so I could compare it to the Coleman Oven. First off, there is little comparison. Lets get that out of the way right up front. The Coleman is a bit of fold up tin that leaks heat like crazy and has very uneven heating. ( I did a review just a bit back. ) This oven has inner and outer walls. This not only reduces radiative and convective heat loss, it keeps the outside a bit cooler. On the stove, it fit “OK”. It is designed to fit on the Butterfly Stove line, but my stove is not here yet. (Due to a problem with the shipper, the oven arrived and the stove didn’t. Oh Well. St. Paul Mercantile was incredibly fast and efficient at dealing with it when I called, taking immediate action the same day. My stove is again on its way.) But I couldn’t stand waiting, so decided to do the “first burn” on the Coleman Stove. Even though it has more concentrated heat in the middle zone so is an excessive test environment compared to the design stove. Yet I think some folks will be planning to use this oven in just this way. In the foreground you can see both the old, and the new replacement burner for the Butterfly Pressure stove I reviewed. I’ve not yet gotten to test the new one, but a visual inspection looks like it is straight. In comparison, the old one looks just a tiny bit ‘tweaked’ where the jet joins the fuel heating tube. More on that in some post yet to be done. Oh, also it looks like the new one has a copper color top while the old one is a bit more brass colored. I don’t remember what the first one looked like ‘pre-first-burn’, so we’ll have to see if it’s a color change in use. (Look at the nut for the color, not the discolored part where flames have made it very hot). During warm up, I touched the sides and top just a bit (gingerly and fast). It isn’t insulated that I can tell, just two layers of metal with air between, yet the sides stayed cool far longer than I’d expected (and vastly more than the Coleman Camp Oven, where inside at 300 F and outside are about 1/2 mm of metal apart… ) I was not brave enough to test the insulation capacity when the thermometer was reading over 125 C ;-) But the way it held temperature when dialed back to medium on the burner implies reasonable efficiency. 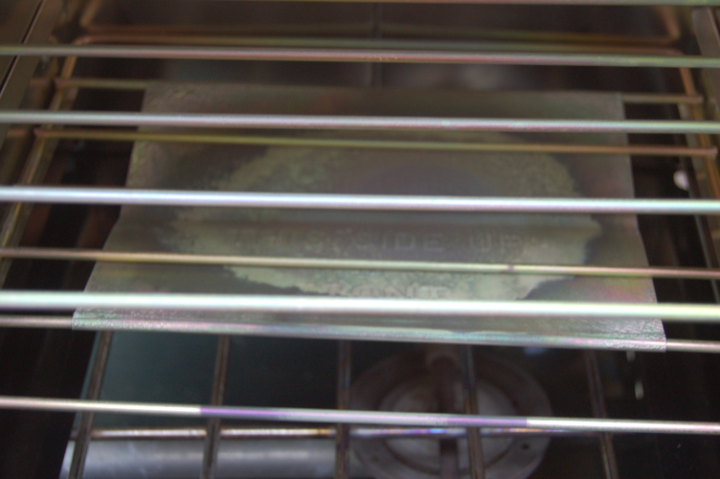 Oh, and the “grating” on the stove got to cherry red right over the middle of the burner during the warm up. It is probably best not to go “full blast” if you don’t need to. The Coleman Oven may need full blast (just to stay warm…) but this one does not. In some future bread making efforts, I’m going to try a ‘slow warm’ at the ‘cruise’ setting on the stove. This picture is a bit visually confusing, what with two oven racks and the Coleman stove grate going all over. Look past them to the sheet metal plate in the middle. (It was still hot… that’s why I didn’t take the shelf out… not liking the idea of grabbing 150 C metal with bare hands ;-) That bit of metal got quite hot over the “full blast preheat”, but unlike in the Colean Oven did not go to “cherry red”. It’s a bit further from the burner. Turning down to “medium”, it doesn’t get nearly as hot. Notice it has discolored. Most metals discolor on extreme heating. I don’t know what metal it is, exactly. It looks a bit like aluminized steel. It has a slight bit of whitish ‘dust’ at the margin of the burn area. At some point I’m going to take it out (once cooled) and evaluate it a bit more. I suspect is is aluminum oxide, but doubt it is an issue. It might also just be ash from some manufacturing oil. I expect that a quick wash and it’s gone and done. If that bothers you, put a ceramic tile over the burner or a square of iron to prevent the “blow torch on the metal” effect. Or get the Butterfly Stove it was designed for. Me? I’m here to do testing and push the edges. Besides, it doesn’t bother me. It’s going to get lasagna drippings on it anyway ;-) “Someday” it might need replacing, if many “blowtorch” events are done. That looks pretty easy. Just a bit of bent tin, really. Heck, wire an old pie pan to the bottom ;-) Though again, IMHO, this part is just doing it’s job and did it fine. It prevented the “blow torch” from hitting what would be on the rack above it. That white stripe is an insulated seal that St. Paul Mercantile adds to the oven (they also upgrade the glass). OK, I’ve not put a loaf of bread through it yet. But this test gives me good confidence it will work. It is generally a good idea to do “first fire” before cooking food anyway as some appliances make a fair bit of strange smells and / or bits of smoke from manufacturing oils or paints. This one did not. There was a hint of some from over by the door hinge and the insulating white fiberglass strip had a bit of discoloration at that end, but well inside normal ranges. So sometime in the next day or two, we will have “First Bake” and I’ll post an update. For now, I’m quite happy. The Coleman Camp oven is OK if you are desperate for a fold up camp oven of minimum space and size. It could make a tin of muffins or some corn bread fingers over some large heat source, like a bed of campfire coals. If you want to bake real meals in small but competent oven, that does not fold up, this one is a much better choice. This entry was posted in Emergency Preparation and Risks, Food and tagged Butterfly, Coleman, Oven, Test. Bookmark the permalink. Talk about one thing leads to another, your posts on off-grid bread making led me to seeing how to make naan, which in turn led me towards making my own natural yoghurt. You never know where life will take you. Off thread, but, I was over at Bishop Hill and there was a thread running about the likelyhood of the UK running out of gas(natural gas, not gasoline) if our cold weather persists for much longer. A number of commenters were proposing getting gen-sets as emergency back-up. What I don’t know is how they cope with balancing generation to use. Is there something that needs to be sorted before connecting one up? That oven looks like the old BOSS ovens from 75 yrs ago which was a copy of the more popular Perfection “Live Heat” ovens. What is old is new again! I’m slowly working my way up from the Coleman Oven on gasoline, through the Butterfly on kerosene, toward the Perfection design. ; though along the way found out that a plain old Dutch Oven (aka American Camp Oven iron pot) works well. Part of the problem with just buying a Perfection is it’s cost, the other is that it was sized / designed for a larger Perfection kerosene stove. So it’s a “high entry point” item. Assuming you want some kind of heat… and maybe more than “getting by”… The “usual” size for most folks is between 2 kW and 3 kW. Many folks get a 4 kW that will surge to 5 kW for starting motors just so they can “do anything”. (I used ours to run the washer / dryer during a long outage once, along with a wall mount air conditioner.) Unless the whole house is going to be wired into an automatic cut over device, you can really just choose what to plug in and support at the time the power goes out. Just about any generator will support lighting and entertainment. So watching TV, running the laptop and charging the cell phone, lights around. ( 10 CFLs, of 11 Watts each, is 110 W and light an entire house. That leaves 900 W to go on the smallest generator most folks will buy.) Personally, I’d likely get a 1500 W “roll around oil filled electric heater” for $40 or so and depend on it, in an emergency. Then have a 3 kW Honda (they are SOooo much more quiet…). That powers the heater, fridge, entertainment stack, and lighting. Seems like enough to me… (cooking on camp stove… though it would run a 1 kW ‘hob’ or electric side burner too if you shut off the heater while cooking). Has a 300 W solution that cost me well under $100. Put a longer extension cord on it, you have light in the whole house and charging laptop / phone / etc. Car batteries are good for about 300 Amp Hours or about 3000 W-hrs, so you have “10 hours to dead”, which means you can use it full blast for 3 or 4 hours before needing to start the car. Much longer if just running a couple of lights. In the middle is the “want more than minimal and less than whole house with appliances”. That puts most folks in the 2 kw to 4 kw size (where most units are sold). Good for lights, electronics, fridge, and one or two larger appliances like a washer / dryer and home furnace (and more than that if you don’t run them all at the same time…) Very few folks use more than 2 kW ‘on average’ and even then, it is often optional high surge things that can be left off in an emergency. Like the All Electric Kitchen and air conditioner pumps… For example, My “heat and cooking” is presently a Coleman Gasoline stove and Dual Fuel Lantern (really a heater with free light ;-) I’m changing over to Kerosene – mostly because of changes in gasoline here in California and the family size changing. So you really also need to look at your whole preparedness plan. If you have a big old propane grill & BBQ on the patio, do you really need to have a generator big enough to run your All Electric Kitchen (AEK) and Electric Oven all at the same time? What threat are the preparations intended to mitigate? I’m planning on Kerosene heat from a lantern ‘post quake’ as I’m expecting to be in a tent in the yard if it’s that bad (home damage). Running fire based appliances inside a closed home in a cold place “is a bad idea” (both CO poisoning and fire risk) and I’d go for a larger generator outdoors and electric heater indoors. (So 3 kW generator instead of 1 kW ) Honda has a neat deal where you can “gang” some of their generators. So you could buy a 2 kW, and try it, and then buy a second one if needed only firing up the second one when running large appliances. OK, the original question was about the UK running out of gas for heat. IFF that means the electricity stays on, why do you need a generator? Get an electric ‘room heater’ and move your heat to the grid. (Yes, I know, if everyone does that while the same nat gas was being moved TO the grid to keep it up, it goes down… but everyone doesn’t do it..) IFF that means potential outage of electricity due to not enough nat gas for that, too, then you need one. Big Questions: How long is the outage? How much gas can you store? (Often limited to 2 gallons or so by insurance rules). The 1 kW Honda runs about 7 hours on a quart. (Part of why I ‘went small’ was the added life of any post quake fuel stored.) So you need to “size the fuel depot” as well. FWIW, a 600W to 900W heat setting on an ‘oil filled electric heater’ does nicely to keep one 12 x 10 foot room warm in winter in California. As a “just barely get by”, I’d get a 2 kW unit. That gives nearly max fuel life, while running everything you need for light, communications, etc. with about 1 kW ‘left over’ for heat and ought to keep about 20 x 15 feet ( 7 x 5 meters) of space “warm enough”. Also, do think of the neighbors. Some generators are frightfully noisy. Look up the dB rating on any proposed unit. (Part of why my 4 kW unit was sold was that it sounded like air races were happening in the yard when running it…) The Honda can be running outside your house and you could sleep in the room where the wire enters. Also, think about “feed in”. The generator needs to be outdoors so you don’t poison your self with carbon monoxide. Lay a ‘drop cord’ in from outside. How do you close the door? For heat in winter, you don’t want a door open 2 inches… A ‘bit of wood’ that fits into a window with a notch for the cord solves that. Well, I’m starting to ramble a bit on that. If that’s not enough, let me know and I’ll turn it into a real posting..
Oven Glass and Gaskets – This is john from St. Paul Mercantile. 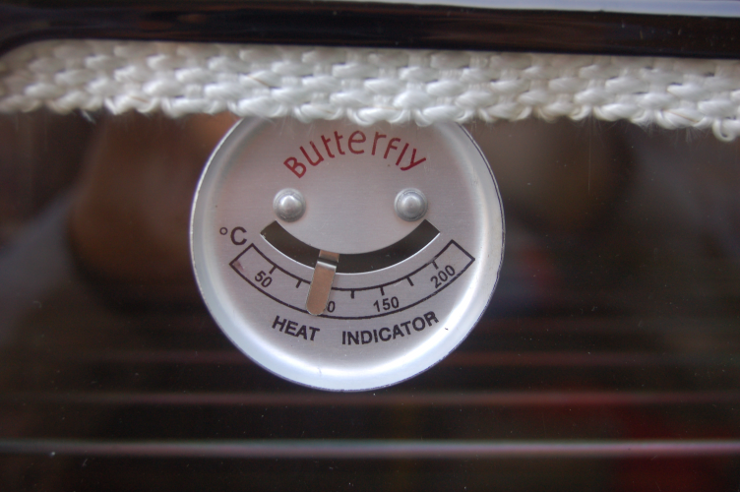 I just wanted to add that the glass on this oven is double-thickness and heat-tempered. The glass that came with it years ago was regular window glass. Heat-tempered glass is much more expensive, but it will not break as easily and if it does, it will break into a thousand small rounded-edge pieces. I also added two fiberglass gaskets for the top and bottom of the glass where the glass is held in place by brackets inside the oven. This allows the glass to expand and contract without breaking. The gaskets are actually fiberglass wicks that go with some of the Butterfly stoves. They can withstand temperatures up to 2000 degrees, so should last forever on the oven. Assembly of this oven is difficult. For that reason, I now offer assembled ovens for a $10 assembly fee. Anyone who has assembled one of these would probably agree that $10 is a bargain. Thanks for that. Plenty to think about. In the emergency power post you linked to, you mention having had a car-starter battery pack that lasted 5-7 years.You’re lucky, the one I had which I also used as emergency back-up lighting, only lasted about a year before the battery packed up. Maybe a case of you get what you pay for. The problem we face in the UK is that gas now provides a substantial proportion of electricity generation, especially with the push to increase wind power needing flexible back-up for 75% of the time. If gas starts running out industry would be the first cut off, followed by power generation, followed by domestic supplies. Spring hasn’t been so awaited for a long time. I’d size the generator based on the “motor start” of the furnace, plus one or two kW depending on what all I wanted to run. 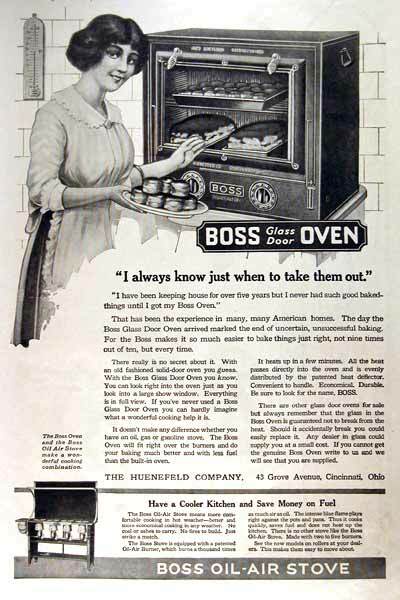 Actually I was referring to the single burner Boss Oven here: http://www.etsy.com/listing/124702137/antique-boss-oven-huenefeld-bread-or-pie?utm_source=google&utm_medium=product_listing_promoted&utm_campaign=vintage_mid&gclid=CLTrqf–kbYCFcqd4AodAFUAyw. Your link was for the double burner version. I have the large double burner Perfection here: http://greencollargirl.com/news/?p=383. They are still being produced and can be purchased here: https://www.lehmans.com/p-2632-fullsize-perfection-oven.aspx. On the subject of aux. 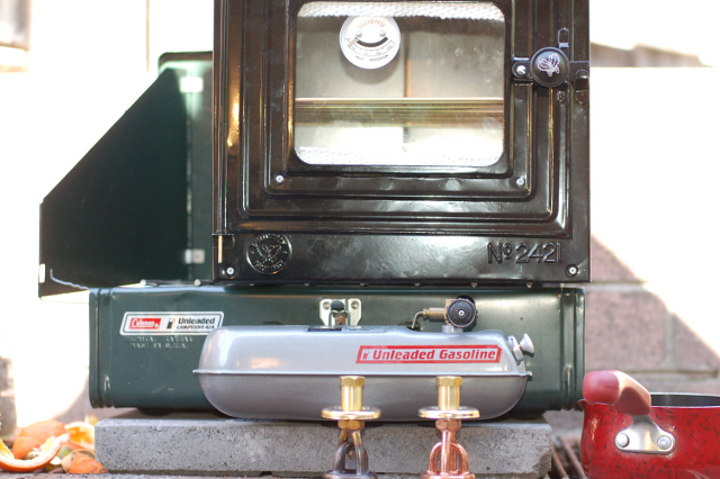 emergency heat, I use a couple of Perfection Kerosene heaters, a 1665 from 1924 and a 1730 from about 1960. Each produces 11,000 btu and burns for 10 hrs on .8 gal of kerosene. I keep a 55 gal plastic drum of the clear kero on hand that I fill with 5 gal cans each payday until full. The cotton wicks don’t like the pink stuff. Only the modern fiberglass wicked heaters can tolerate the red dye. And of course, I have my Perfection portable 2 burner stove for cooking if needed. Add some #3 Queen Anne lamps and I have light, heat and hot food from one fuel source. Kero keeps for years if kept in a sealed container out of the sun. I have some from the big ice storm of 1998, when the Army handed it out to villages to distribute that I still use. It was just what came up on a search for “BOSS Oven”… Glad to see it is based on a well known design. So you actually have one of these things? On the other thread where you suggested there were no kerosene smell issues due to all the folks from bygone days using them (and I proceeded to say that was nice and all, but wanted current proof as my ancestors on the farm put up with lots of odd smells…) you didn’t say you had one. As I’m generally accepting of “first hand reports of use”, I’m very interested in actual experienced. So far, using the Butterfly Pressure Stove (the new burner has fixed it’s ‘issues’) I’ve become more impressed with Kerosene. Even less odor than gasoline or Coleman fuel in a stove. First loaf of ‘test bread’ is out of the oven. It’s a “good news / mediocre news” story. First, the good news: The oven is WAY more efficient than I’d originally thought. It holds a nice baking temperature on a medium low setting of the burner. Heat is even, an the loaf browned evenly and well in the first 15 minutes. (The glass made keeping an eye on things easy and effective). OK, at 75 C it was doing 275 F. (Realize this was also with the door slightly open for the probe, so likely running 300 F when sealed. Last I looked, 75 C was about 175 F (keep warm, not roasting a large turkey…) At 150 C, that ought to be about 302 F, it was a bit over 425 F.
OK, I’m used to bad thermometers built in to things. I expect them to be off by 25 F or so. But 100 F of “off”? I’ll most likely be taking the built in temperature gauge out of it and just tossing it. It will be easier to use a dual scale one anyway. I bought one about 8 months ago (that I can’t find right now ;-) so can just set it into the oven. Thanks to the 15 minutes on what I thought was about 350 F to 375 F, that was likely closer to 500 F, I have a nice loaf of Rye Bread with a VERY dark crust and a bit of an “overly toasted” aroma. The inside of the loaf will be fine ( I’ve done this particular ‘over cooked’ before in other test bakes when gauges were off. The crust gets hard and dark and “aromatic”, but the insides stay nice.) And as I’m the only one who eats Rye in my house, I don’t have to worry about other folks complaining. This “way low” reading would also explain why I had to run the burner so hot in the “First Fire” to get an indicated 175 C on the gauge. ( 350 F) A normal baking temperature. Running the burner on “blowtorch” setting to get the oven warmed up “nice and hot”, clearly overheated the deflector plate. (Melting off the aluminum). Largely because it was really trying to reach closer to 450 F in the air near the door, so it was also much hotter where the burner flame was impinging. All that is needed is a ‘Medium high” burner setting, even for rapid warm up. (Oh, and an accurate oven thermometer. The oven held a ‘slow bake’ at about 275 F on a fairly low burner setting. As I usually cook bread at 325 F, it’s only a bit higher than that. So this is one VERY efficient oven when it comes to fuel burn. The outside temp was 40 F when I was doing this (yes, “dead of night”. I wanted to give it a cold environment to ‘challenge’ it. The oven didn’t even notice the outside cold. It will work at freezing. With a medium burner setting, it held about 350 F. ( I say “about” as I’d set the burner, wait, open the door and insert thermometer, wait.. read… And by then, if it was not the target temp, well, “it is what it is”. Tomorrow I’ll try again with a loaf “for the family” now that I know it reads “way low” and see if I can get that “perfect mellow tan loaf” that I like so much. I’m sure this oven can do it. It’s now just up to me to get it calibrated. FWIW, the Rye Bread came out pretty good. The crust is a little over done, and with some added ‘browned a bit too much’ flavors, but otherwise fine. At least on Coleman Fuel there isn’t any ‘odd flavor’ in it. Don’t know as I’d want to try Unleaded Gasoline if kerosene is available. Kerosene ought to be about as pure as Coleman fuel, just a bit heavier cut. Looks like just “get a decent thermometer in it” and I’ve got a decent oven. I currently have a portable single burner Perfection #110, circa 1942 and a portable double burner Perfection #320A. 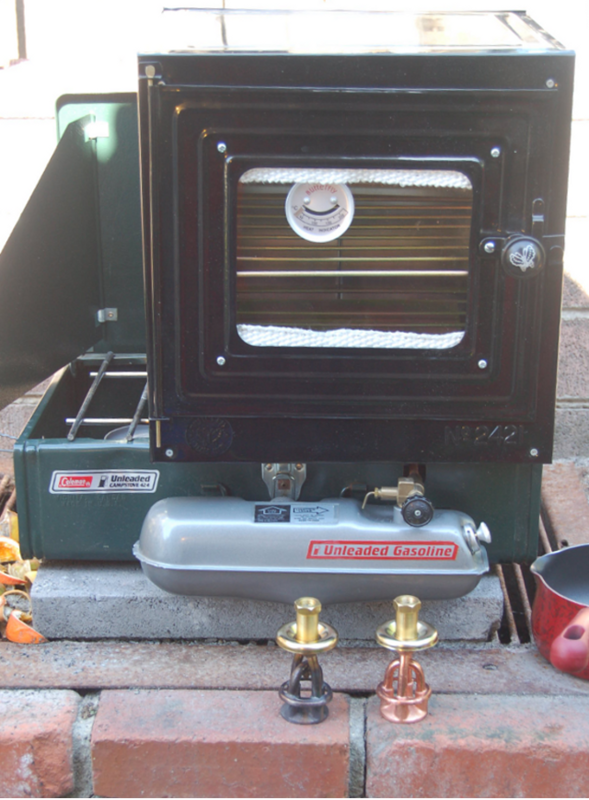 The restoration of these stoves and my heaters ( Perfection 1665 & 730) can be seen at the Yahoo group ” Kerosene Heater and Stove Collector” in the Photo section. http://groups.yahoo.com/group/KeroseneHeaterandStoveCollector/?m=0 You will have to join to see the photos. I have never cooked bread in a Perfection oven, just biscuits and Pizza, meatloaf, etc. I need to try other things with the Perfection oven, like use it as the only oven for a week and learn all the ins and outs of it. I do have a circa 1920’s Perfection cookbook from Ebay that I need to look at more closely and duplicate the recipes. There is a difference in taste between an electric oven and ANY oven that burns a fuel. The difference is electric ovens heat dry air. A “fuel” oven produces moisture from the flame. I can’t afford the new Schwartz stoves either. $800 for a new three burner or $150 for an antique that needs restoration. I regularly cook on the double burner portable. It is slower that gas but I enjoy the novelty and after doing it for a week straight, it becomes second nature to clean the wick and light the burner with a match. Once learned, it is a skill that can be filed away for when it is really needed.